Calf and feeder prices held up remarkably well in the early part of the fall run. 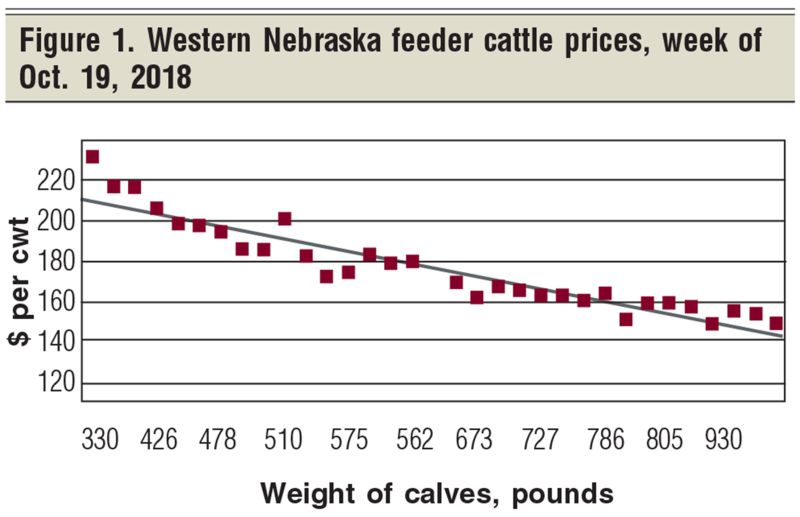 As this Market Adviser was being written, mid-October 2018 western Nebraska standardized steer calf prices, compared to mid-October 2017 standardized steer calf prices, were about the same. 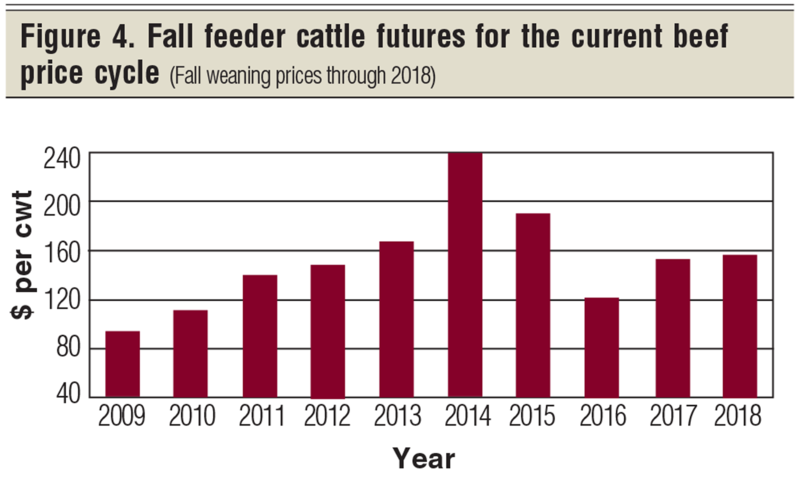 Basically, lighter-weight feeders were discounted a little more in 2018, and full or fleshy calves were also discounted. The 2018 prices are somewhat better than many predicted, due largely to the current stronger beef export market. As my study rancher started to set up his 2018 calf marketing program, I took the opportunity to share my latest monthly market price projections with him. These were designed to evaluate marketing his calves at weaning, backgrounding his calves, finishing these calves, and retaining ownership of his calves in a commercial feedlot. Let’s look at some of the information we used in this year’s “fall review” as the focus of this Market Adviser. Related: What's the economic impact of the current cattle cycle? My study rancher was pleasantly surprised at how well calf prices were holding up going into October, given where we are in the cattle cycle. I attribute a lot of the current price support to a strong export market for beef. Figure 1 shows the Nebraska sale barn market summary for steers for the midweek of Oct. 19, 2018. Note the significant variation in market prices received around the linear trend line here. This variation in prices received was due to the quality and condition of the feeders being marketed. 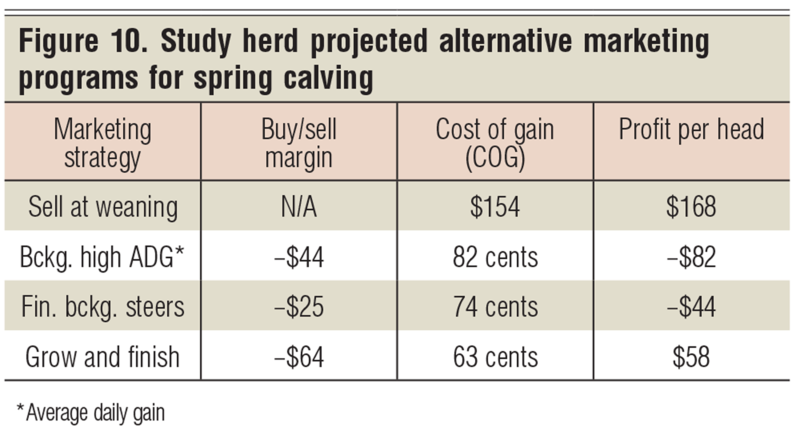 I did a statistical analysis of these market prices which indicated that producers marketing “fleshy” and/or “full” calves suffered an average of a $12-per-cwt discount for their feeder calves. I hope none of my readers experience this kind of a price discount for their 2018 calves. I find Figure 1 prices are a little hard to generalize. 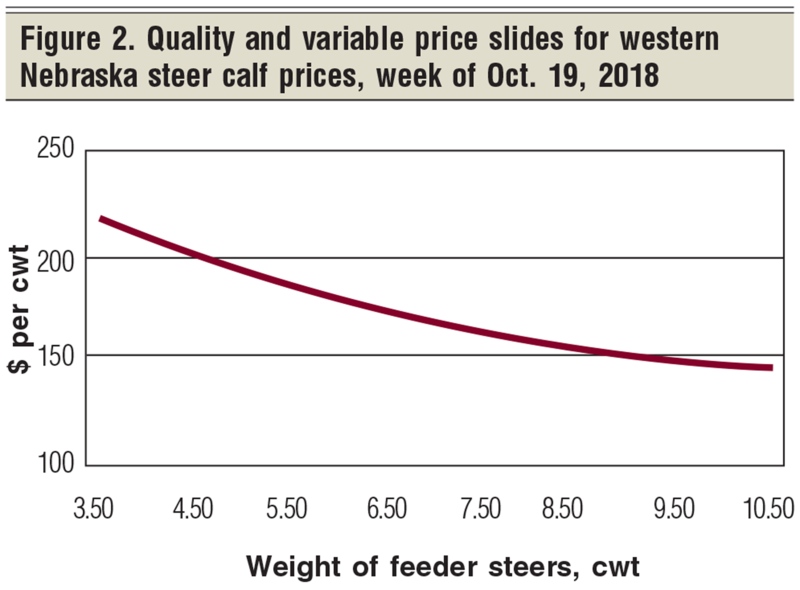 So, I statistically removed the quality differences in feeder prices and allowed the price slide to vary with the weight of the feeder steers. Doing so, I end up with a more usable price series as presented in Figure 2. I used these standardized prices in all my economic evaluations of producing fall weaned beef calves in 2018. So, how do these mid-October 2018 western Nebraska standardized steer calf prices compare to mid-October 2017 standardized steer calf prices? Figure 3 suggests that the prices of these two years were about the same. 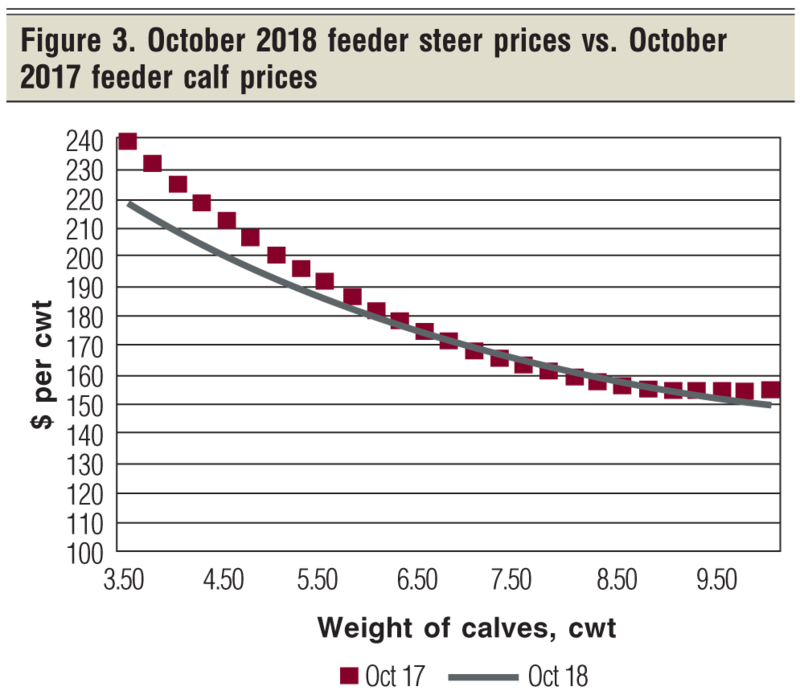 Basically, lighter-weight feeders were discounted a little more in 2018. These 2018 prices are somewhat better than I had earlier predicted. Again, I attribute this to the current stronger beef export market. 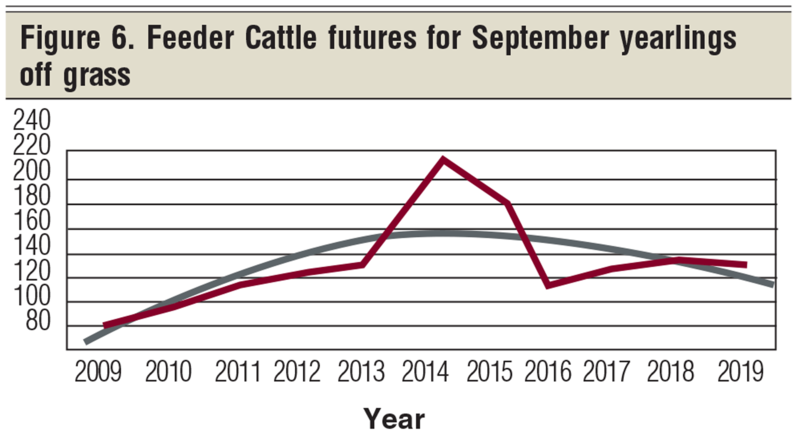 Figure 4 presents the yearly fall feeder cattle futures price for the current beef price cycle. Once again, 2018 looks like it will about parallel 2017, showing some price support from today’s stronger beef exports. Keep in mind that we are still adding beef cows to the national beef cow herd. This beef price cycle is nearing its end, but we probably are not there yet. Hopefully, beef export demand will hold beef prices up some for the rest of the current beef price cycle. Figures 5 and 6 are presented here to help analyze selling backgrounded calves in February 2019 and/or selling yearling steers off grass in September 2019. 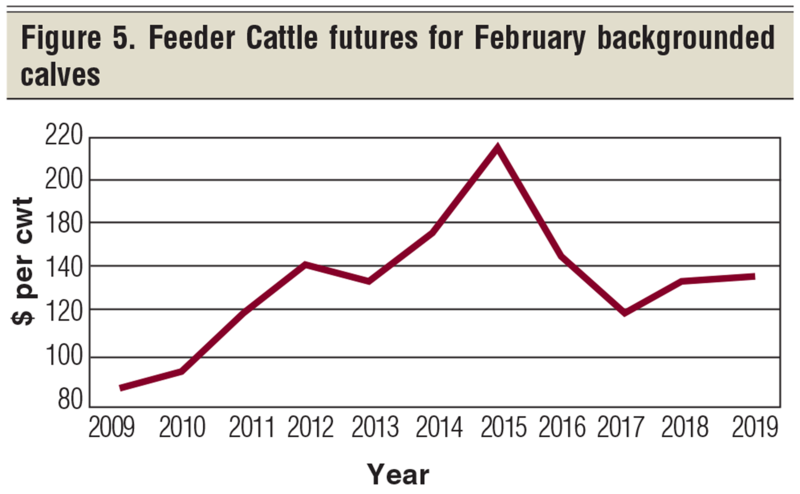 February 2019 backgrounded steers are projected just slightly higher than February 2018 backgrounded calves. Steers off grass in 2019 are projected just slightly lower than 2018 steers off grass in September. 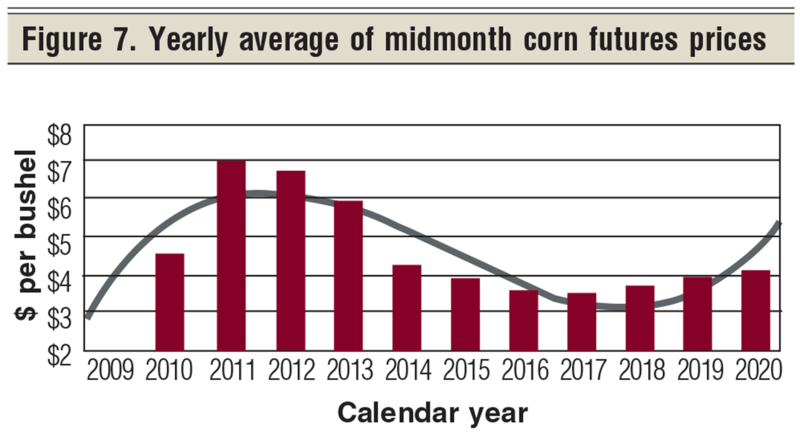 As one thinks about backgrounding and/or retaining ownership of 2018 calves, it is useful to take a longer-term look at corn prices as an indicator of changing costs of gain in growing and finishing 2018 calves. Figure 7 presents annual corn futures prices over the current beef price cycle (2009 to present). It is worth noting that corn futures prices have been increasing since the low in 2017. This suggests, at least to me, that the costs of gain for finishing 2018 calves are probably going to increase. 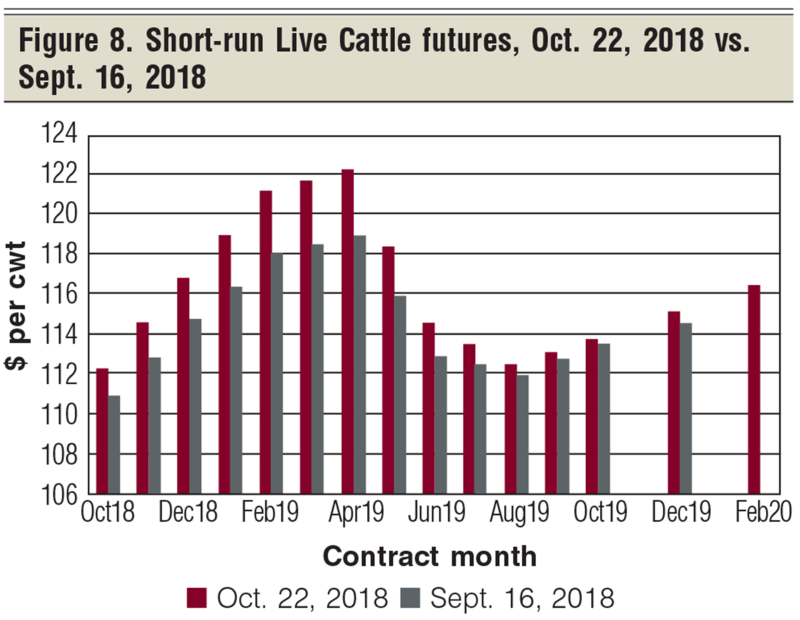 Figure 8 summarizes the short-run change in slaughter cattle futures prices from Sept. 16, 2018, through Oct. 22, 2018. It is important for you to follow these short-run changes in the prices of slaughter cattle. I recommend that you prepare a chart like Figure 8 once a month as an ongoing study of monthly slaughter cattle prices. This rolling monthly chart tells you a lot about the dynamics of finished cattle prices and does not take much time to prepare. This is much easier said than done. That is why the slaughter price is generally higher in April and May. Most 2018 spring-born calves, however, will be marketed in June. That is why the June slaughter price is typically lower. If I background 2018 calves and then move them to a finish program, I project them to finish in June — generally not a favorable marketing option. Figure 10 presents my projected economic returns for the study herd. Marketing at weaning was projected to earn $168 per cow — down a little from 2017 due to my study rancher’s $35-per-cow increase in production costs in 2018. If he backgrounded his calves, he was projected to lose $82 per head. 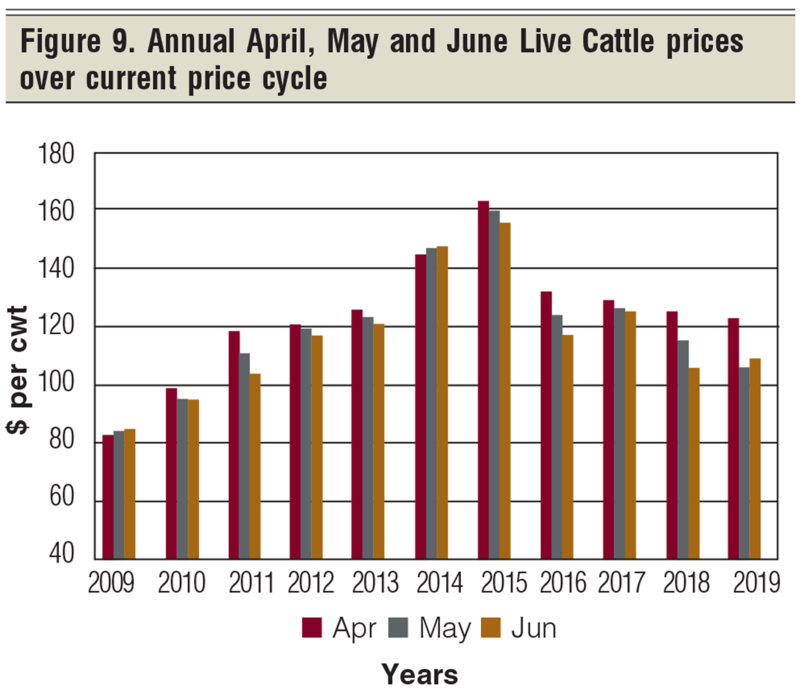 With the exception of 2016, when calf prices were extra-low, backgrounding during the downward portion of the beef price cycle is not proving to be profitable. Finishing backgrounded calves with a June target marketing date is also projected not to be profitable at a minus $44 per head. Interestingly enough, retained ownership with a targeted May harvest date is projected to be profitable. Retained ownership has been profitable each year in the downward portion of the beef price cycle, if marketed in May. It looks promising again in May 2019. Stay tuned.